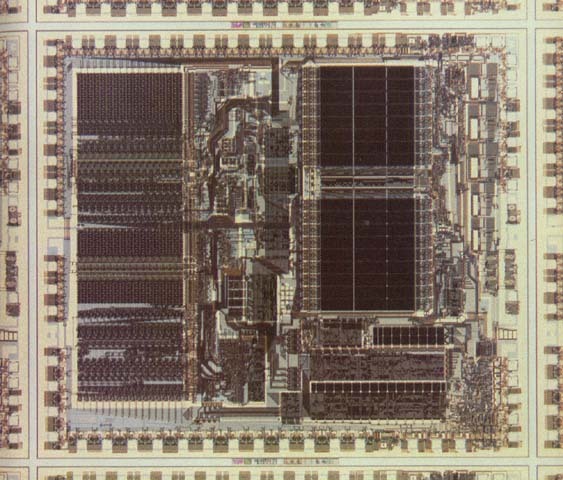 The 68000, shown here on an uncut wafer next to other 68000 chips, can multiply two 16-bit numbers in a mere 3.2 millionths of a second - fifty to sixty times faster than 8-bit microprocessors like the Intel 8080 (p. 36). Eight-bit microprocessors can multiply only by repeated addition, whereas 16-bit microprocessors can contain circuits that enable them to multiply numbers in only a single operation. Actual size of the 68000: 0.246 x 0.281 inches.